Athens, city that that helped lay the foundations for western civilization, leaves a lot to be unearthed in present times. There are historic spots galore where institutional democracy was formed, and temples dedicated to the worship of iconic gods and goddesses. From music and dancing, an ancient linguistic tradition, and phenomenal cuisine, Greek culture itself is something quite distinct. We have compiled a list of the 10 oldest restaurants in Athens, which will give you a taste of all three. Vassilenas boasts the title of being the oldest restaurant in the city. In the summer, you can enjoy your meal in Vassilenas’ rooftop garden, overlooking the city. Today, Vassilenas serves elevated, New Greek cuisine on a ten-course gourmet menu. The restaurant also claims to have introduced degustation, or the sampling of several small courses of heightened culinary excellence, to the city. Each menu is expertly prepared with wines to complement the flavors involved. Still housed in its original building, Vassilenas has been completely renovated and today sports a refined, modern look. Located near Syntagma Square, Doris is one of Athens’ oldest restaurants that will offer you a traditional culinary experience with a laid-back ambiance. It is a hole-in-the-wall sort of place where you can find simple, quality Greek fare. Everything is homemade from scratch, and ingredients are well sourced. Here, you will find menu items like herring, stuffed grape leaves, tarama, and roasted eggplant. The staff is old-school (they dress in white collars and bow ties) but also very friendly. They also have air conditioning in the summertime, a major plus when things heat up. It is a quiet place that is frequented mostly by locals rather than tourists. Taverna Sigalas is a kitsch Greek tavern located in an old building in the Plaka district. For one hundred years, the same family has been running this place. Clad in blue and white paint, the interior is filled with old photos of Greek movie stars, and the air is filled with the sound of old Greek ballads and sometimes even a live accordion player. As for the food, you will find tasty stews, gyros, and other Greek homemade delights. Taverna Sigalas stays crowded throughout the day with Greek families and locals (some of whom love to sing along to the music), despite its central location and proximity to the subway. Ideal‘s menu specializes in traditional Greek food with French influences in its bistro style. The restaurant is decked out in 1930s style with Art Nouveau details, sumptuous color tones, and marble accents. The atmosphere of this vintage style restaurant alone makes it worth visiting. Plus, portions are large and hearty. There is usually a seafood special served in traditional Greek style with lemon and olive oil. Other menu items include the popular soutzoukakia, along with other Greek specialties. Ideal also touts some of the best, most professional waitstaff in the city. Making a reservation is recommended. 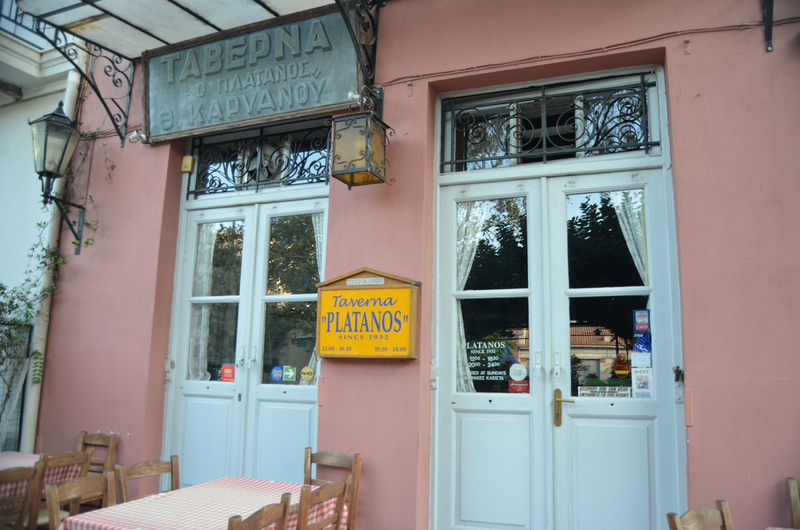 Platanos Taverna is a restaurant in Athens with an intriguing history and authentic cuisine that has earned it a lot of notoriety since its opening in 1932. Located in a pastel pink building on a quiet street lined with trees, Platanos Taverna was popular amongst writers, poets, and artists during its heyday. Platanos Taverna also serves traditional homemade retsina wine. Today, you can enjoy your meal under the shade of the trees, which form a canopy over the outdoor patio. Menu items include stuffed calamari, mousaka, grilled fish, stuffed tomatoes, tzaziki with fresh bread, boiled meats, and baklava. Damigos is a family-run restaurant located in a basement, equipped with a squat wood stove and a large old stone pillar at the center. It is the perfect spot to enjoy a meal on a cool day because the atmosphere is quite cozy. Another old-school trademark of Damigos is that the wine is still stored in large barrels, which you can see from the dining area. The wine itself has been made on the family’s vineyards since 1835. The menu features stews, traditional Greek salads with feta, codfish, roasted veggies and fresh breads, all at reasonable prices. Located in an old mansion, Psaras Fisherman’s Taverna is the oldest restaurant in one of Athens’ most historic districts, Plaka. It has an authentic Greek ambiance with stonewalls and a large hearth at the interior, as well as a lovely garden for dining alfresco. They also offer live music every night. The restaurant is popular with prominent locals, and is a great spot to dine if you’re looking to escape the more touristy spots in the neighborhood. You can sample a number of traditional Greek dishes here including dolmades, anchovies, grilled Greek cheese, prawns, and desserts. Named after the Greek ruins where members of the ancient civilization worshipped the god Apollo, The Delphi is one of the longest standing restaurants on the Plaka. It is a small restaurant with a simple wooden exterior. They serve a wide variety of Greek specialties from salads to fricassees. Prices are quite reasonable, and there is air conditioning. There isn’t a whole lot of space to eat inside, however, so we suggest ordering your food to go. This option is also cheaper. To Kafeneio is a traditional Greek coffee house located in a building that is over 400 years old on the historical Epicharmou street in the Plaka district. This place specializes in coffee, snacks, tapas, and desserts. Some popular items include meatballs, fried zucchini, panacotta of costis, eggplant salad, and marinated olives. In addition to this, To Kafeneio also ages wines in barrels in their cellar. The ceiling features glow-in-the-dark constellations from Greek astrology as an ode to their ancestors. The interior is rustic with wooden chairs, exposed brick walls, lace curtains, and wrought iron windows. The name Paradosiako means ‘traditional,’ and that’s the kind of experience you’ll find at this old restaurant in Plaka near Syntagma Square. It is a small restaurant that is decorated with quirky artwork and adorned in red flowers, its trademark. As for the food, it is rustic and flavorful. The fava been dip with fresh olive oil showcases amazing flavors, but you can also try their baked feta, meatballs, grilled salmon, or their moussaka, prepared with a bottom layer of diced potatoes (as tradition dictates). Instead of dessert, the restaurant offers fresh watermelon as a complement to the guests, another old-school practice.